This is one of my daughters’ most cherished memories of our visit to Universal Studios Florida. One rainy evening we stopped by to check out the Knight Bus and the conductor, a friendly chap named Nigel, chatted us up. The Knight Bus is a full sized triple decker bus sitting in the streets of London. just outside of Diagon Alley. 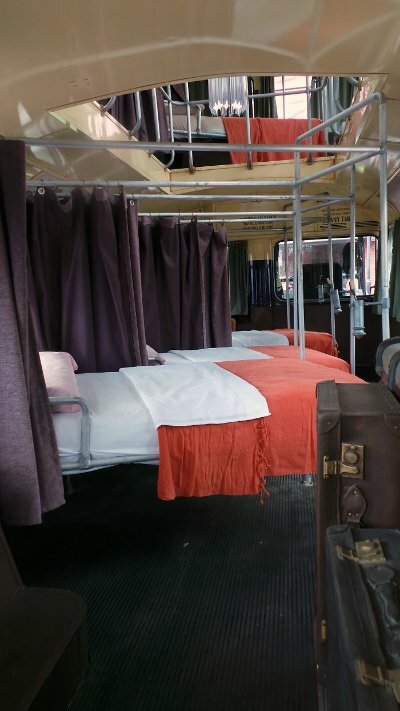 It, of course, looks exactly like the Knight Bus Harry Potter rides on in Harry Potter and the Prisoner of Azkaban. You can’t board this version of the bus, but you can get a great photo of you standing just outside of it. And you can chat with the conductor and the driver. Now, maybe you’re thinking that doesn’t sound too exciting, but actually, it’s one of those small magical Universal moments that I would rate as absolutely not to be missed. The Knight Bus at Universal Studios Florida is one of the two actual prop buses used in the film Harry Potter and The Prisoner of Azkaban. 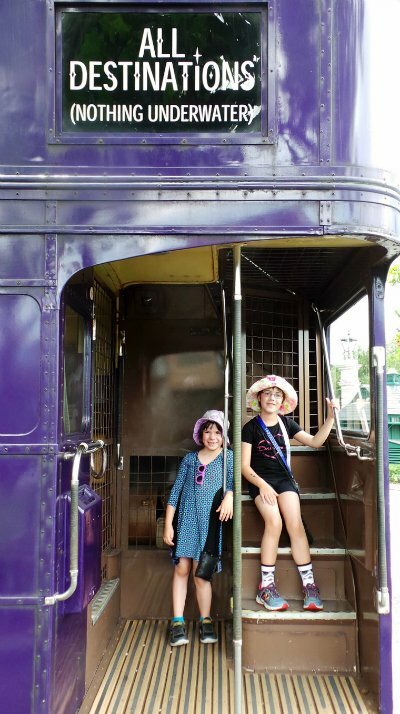 We visited the Knight Bus near the end of our second day in the parks at Universal Orlando. It was close to closing time and we were trying to kill half an hour, waiting for the grand fireworks finale they put on every night. It was raining on and off, and as we walked the make believe London streets in the area outside of Diagon Alley we almost skipped right by the Knight Bus. After all, it was raining, and it was starting to get dark out. Hardly the ideal moment for a photo opp, right? 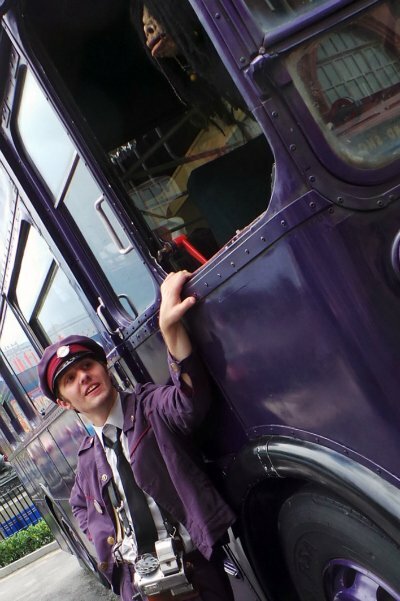 A young gent in a conductor’s uniform was standing next to the Knight Bus. 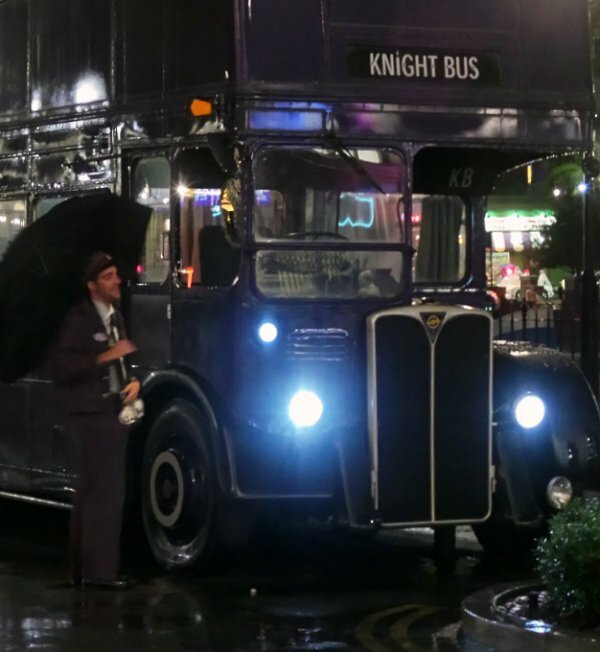 He had a wide black umbrella spread over his head and was leaning towards the driver side window, apparently passing the time chatting with the Knight Bus’s driver. He spotted my girls, smiled and said hello. My youngest tugged on my hand, we walked over and the conductor introduced himself as Nigel. And that’s when we really noticed who he’d been talking with. 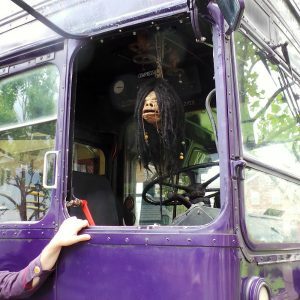 You see, in the driver’s side window of the Knight Bus is a shrunken head. A dangling from the ceiling, hanging in front of the steering wheel, shrunken head. And here’s the fun part, there is some hidden technological wizardry at play here. The shrunken head talks. And it doesn’t just spew out random statements, it actually interacts with you. Nigel asked my daughters how they were enjoying classes at Hogwarts. He asked my eldest daughter which house she’d been sorted into, and she told him she was a Ravenclaw. Nigel’s pal, that shrunken head dangling over the steering wheel of the bus, chimed in through the open driver’s side window, “Ravenclaw, ya man, good head on her shoulders”. It was maybe six minutes carved out of a several day long vacation, but it is six minutes that my girls still talk about. A tiny bit of pure magic, taken from the magical wizarding world of Harry Potter, packed away into our memories and smuggled all the way back to my daughter’s bedroom. So kudos to Nigel, if that’s his real name — a star, who performed his job with genuine glee, spoke to my wee girls as though they were real people (and real wizards), and gave us one more memorable shining “Universal moment” to take home with us. 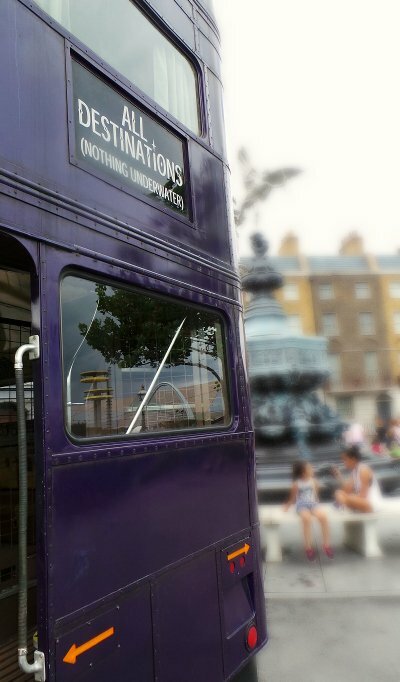 If you visit the Knight Bus be sure to go around the back end of the bus, where you can step in, see the inside of the bus, and get a cool photo or three. We missed this the first time, and it’s pretty neat. Here are a few photos from when we came back to the Knight Bus during the sunshine (and queued up to meet with a different conductor named Simon). Neat photo opp at the back of the bus. 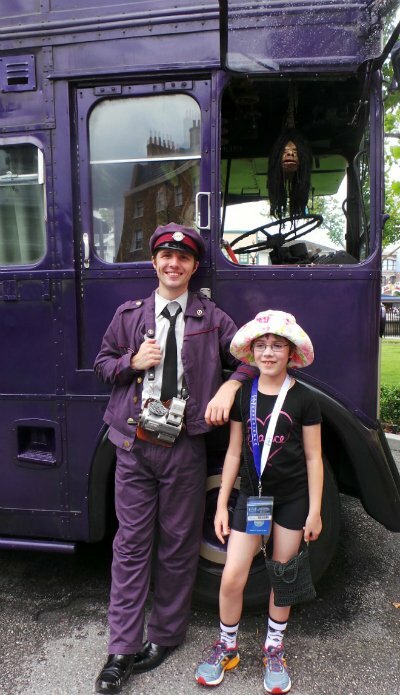 Meet the Knight Bus conductor and his shrunken head friend. 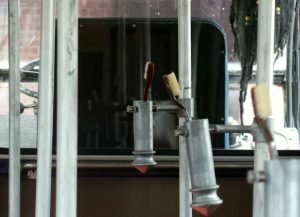 What famous wizards may have touched these toothbrushes? The photos of the inside of the Knight Bus were taken through a metal grate. You do not actually get to set foot inside the bus, merely stand on the “back landing” area (the spot my kids are standing in the photo above). Still very cool, and well worth a look. During the daytime, there was a queue of people waiting to meet the conductor. It wasn’t just a rushed photo opp. They actually took the time to talk to each person, ask their name, let them ask questions, talk about the Wizarding World of Harry Potter etc. It was totally worth standing in line for a few minutes to get another chance to chat with the shrunken head and his conductor pal. 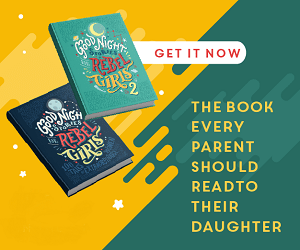 My ten year old had a fun conversation about how as a Ravenclaw she doesn’t like to play Quidditch, but she has read the definitive history of the game, twice. While our daytime encounter with the Knight Bus wasn’t quite as magical as the nighttime one, it is still an experience I would highly recommend for any Harry Potter fan. Disclosure: My family purchased a ticket to attend both Family Forward 2016 and 2017. We would like to thank Family Forward, Mom It Forward, Universal Orlando Resort, and Loews Hotels for the many special perks and behind the scenes moments we were treated to. My girls would totally understand this reference and love this too! Sounds like you all had so much fun on this adventure together. Aw what a memorable experience for them! That sounds really cool! I’ll remember this if we get there someday! Wow – super cool – the ultimate destination for Harry Potter fans! I love reading these posts! Makes me want to go visit Universal even more with my son! I’m so glad to have read about this experience! We would love it!